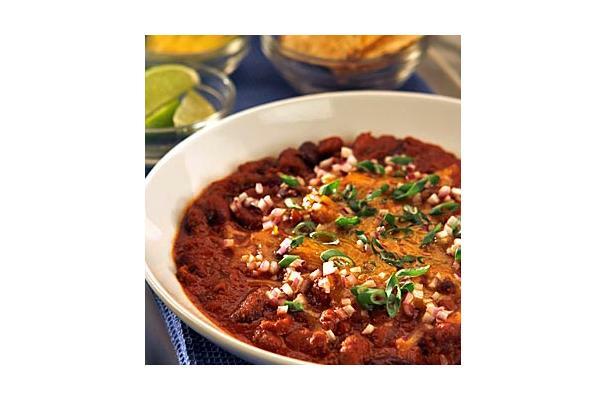 Place a dry skillet on a high heat and cook the guajillo chili for a couple of minutes, turning so that both sides are seared. Now put the chili into a heat proof bowl and pour in the boiling water. Let the chili soften for about 10 mins. Take the canned tomatoes, tomato paste, chipotle pepper and put into a blender with the cili and water. Blend until smooth and save. With a little olive oil, cook the turkey in a heavy pan with a medium/high heat. Keep stirring to ensure the turkey is completely cooked. should take around 10mins.Drain any excess fat but leave about 1 tbsp in the pan. put the turkey to one side. Add in the diced onion with the poblano chili and cook for about 6/8 mins or until the onion is translucent. Add the garlic and cook for another minute. Now add all the other ingredients (not tomato soup or salt) and cook for another minute. Then add the soup.Put back the turkey and the chili mix from the blender and add salt to taste. Put the chili into a slow cooker and set on low for about 3 hrs. 30 mins before serving add in the kidney and pink beans and continue on low. Serve with some tortilla chips and shredded cheese. Garnish with green onion (sliced) and cilantro.